ArcSoft haven't released a new major version of TotalMedia Theatre for more than a year so this part of our 2012 Blu-ray player reviews will partially retell some stuff from last year's article. TMT 5 got some updates during that time though, with optimizations, bug fixes and even some features, so we will cover that. TotalMedia Theatre 5 was a major update since TMT 3 (version 4 was skipped, thus showing the big leap from version 3). With TMT5 ArcSoft got rid of the multiple editions like Standard, Gold and Platinum and went with just TotalMedia Theatre 5. The others should do well to follow this and unify their offers. The most important addition to TMT 5 was the support of Blu-ray 3D. The Sim3D engine, which is doing the conversions from 2D to 3D, was improved and optimized. After the latest updates the upscaling engine SimHD now includes support for OpenCL on AMD graphics cards (NVIDIA's parallel computing architecture CUDA was already previously supported on NVIDIA hardware). And similar to CyberLink's TrueTheater Effects engine, SimHD includes video post-processing features like noise reduction and framerate smoothing. ArcSoft have been carefully watching CyberLink's love affair with the Internet. Their online venture though is in a slightly different direction and is mostly focused on YouTube. TotalMedia Theatre 5 can serve as a YouTube browser and player. 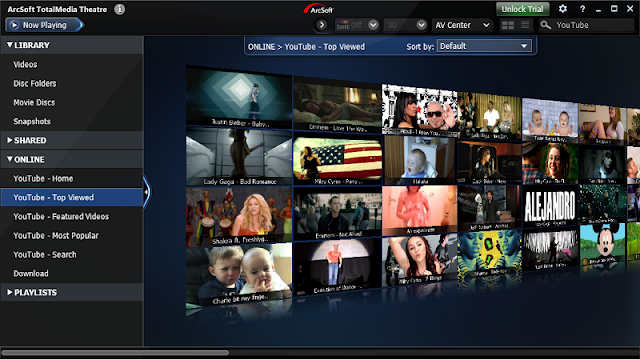 It allows searches for particular videos and access to the Most Popular and Featured channels. The user can also link and share the currently playing YouTube video to their profile on Facebook. The user interface of TotalMedia Theatre also got more minimalistic and slicker, and thus feels more streamlined. An elegant interactive grid of thumbnails called Magic View (check the screenshot), which is essentially a very nice media browser, allows browsing all the video lists: user playlists, UPnP media servers, YouTube, the library. You can preview media directly on the grid. A beautiful feature that can also be switched off if you get dizzy by awesomeness like this. There is a Smart Menu feature simulating the pop-up menu of BD movies for DVDs and video files. It enables the user to bookmark scenes or search in IMDB for information about a particular movie in addition to the usual subtitles, audio and chapters options. The integration with Windows Media Center is also improved. It is abundant of features and trouble free. TotalMedia Theatre 5 added support for various file formats, most notably FLAC, WTV and AVCHD 3D, making it a pretty decent dedicated media player. It also has a pretty extensive and useful subtitles system with manual subtitles selection for video files (unlike PowerDVD's auto subtitles) and What-You-See-Is-What-You-Get positioning of the subtitles. It was also the first Blu-ray player software to include BDMV support (playback from Blu-ray folders). The latest updates have also added various improvements for MKV playback: audio bitstreaming, chapters support, SRT and VobSub subtitles from the container, plus multiple audio tracks support. A notable unique feature of TMT deserving mention is the support for HD DVD. If you happen to have guessed wrong during the format wars and have an HD DVD collection then TotalMedia Theatre should obviously be your player of choice. A cool recent addition to TMT 5 is the ability to temporarily switch the display's refresh rate to match the frame rate of the video source. This means that if your display has 24hz support TotalMedia Theatre will automatically play Blu-ray discs (and 23.976 fps files) in 24p. Pretty neat. Similarly to CyberLink, ArcSoft have also released Android and iOS apps, which turn mobile devices into remotes for TMT. One minor annoyance with ArcSoft's video player which keeps presenting itself version after version is the need to reboot Windows in order to finish off the installation of TotalMedia Theatre 5. Yes, you do this once and it is certainly not a big deal, but, hello, this is 2012 and that's a thing you don't endure with neither PowerDVD, nor WinDVD. Check the link for an active ArcSoft coupon. Our Blu-ray player software reviews continue with Corel WinDVD Pro 11, Nero 11 Platinum and Roxio CinePlayer with 3D.